Ok ... I have completely revamped the clothes for my nephews July wedding after this happened. I put away the long sleeve button downs and ties and ordered shorts and short sleeve wovens. If I had known we would be outside in the heat of the day I would have planned accordingly ... but better late than not at all! Paper Girl and I hit the Lilly stock and I ended up with this cute dress! I love that it has skinny dippers with sensors on their bums ... it makes me giggle! It is super thin which will be fabulous considering the wedding is at 12:30 outside in July! I tried on a bunch of cute options and thought I had settled on the Ricci but then realized it might be too thick for the hot temps! Adorable dress and light weight ... which will be great! We are pairing with white ballet flats from Nina and bare legs since it will be 112 degrees. I am taking white sandals for the reception in case she needs a change! She and I are both wearing white eyelet dresses for the rehearsal ... a tunic dress for me and a shift for her. Both are darling and will be perfect for photos! 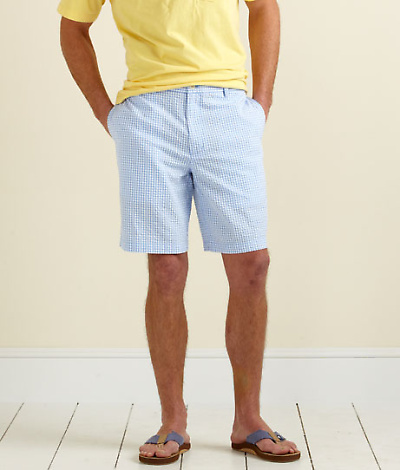 Blue seersucker shorts matched with navy polos. The teenager refused to wear plaid shorts and I understand. This was the closest I could get away with to the solid he requested. I am still deciding on a wedding shoe but they both have Rainbows for the reception so they can be comfortable since we are dining outside. Khaki shorts matched with this shirt from Canvas. Great shirt and neither will have to have it tucked in which they both hate. Rainbows for shoes ... all good to go! Lawyer is on his own. He is super preppy and will probably be decked on in Vineyard Vines shorts and a polo for the rehearsal and brown seersucker pants and a short sleeve button down for the wedding. He has a pair of crab shorts that I love and his brothers insist look like boxers. He loves to wear them just to stress them out. He loves to push buttons. Drives me batty! It's done and I feel good about it!